Who will tell the stories of those who refused to be slaves? The Atlantic slave trade transported millions of humans from the coasts of West Africa into the New World, stripping them of their dignity, freedom, language and culture. The accepted notion is that these Blacks willingly submitted to the chattel slave system, accepting their new lot in life. When one scours the records, a different story emerges. Black Rebellion chronicles the active resistance of Africans in the New World against their oppressors. These firsthand accounts reveal much that has been neglected in the traditional telling of history. 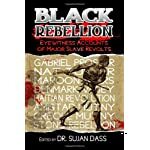 Black Rebellion is a collection of historical literature documenting major slave revolts and uprisings throughout the Americas, written primarily by contemporaries and eyewitnesses. 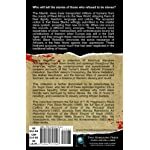 It contains accounts of Nat Turner’s Revolt, Gabriel Prosser’s Rebellion, Denmark Vesey’s Conspiracy, the Stono Rebellion, the Haitian Revolution, and the Maroon Wars of Jamaica and Surinam, as well as a timeline of Western slavery and revolt. This collection is further illuminated by an introduction by Dr. Sujan Dass. 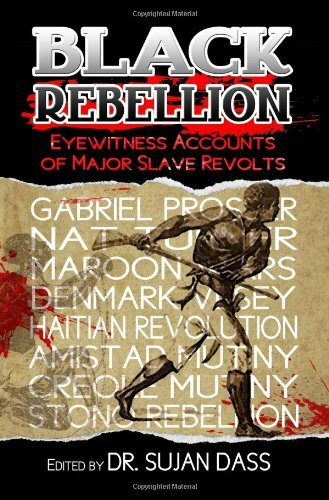 Other essays address why most slave revolts were betrayed by fellow slaves, the role of music in rebellion, and resistance to slavery among African leaders. 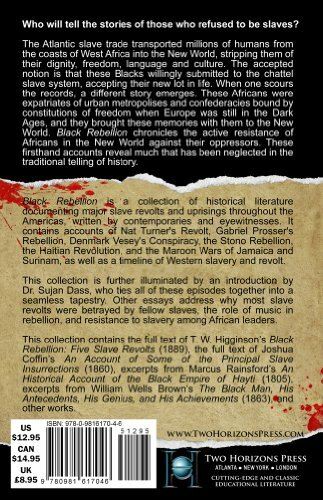 Contains the full text of T. W. Higginson s Black Rebellion: Five Slave Revolts (1889), the full text of Joshua Coffin s An Account of Some of the Principal Slave Insurrections (1860), excerpts from Marcus Rainsford s An Historical Account of the Black Empire of Hayti (1805), excerpts from William Wells Brown s The Black Man, His Antecedents, His Genius, and His Achievements (1863), and other works.